I have been buying bananas at the grocery store each and every week for the past few months. I have been waiting for some extra bananas to be sitting on the counter at the end of the week, but they have been getting eaten up . . . so, last week I bought extra bananas on purpose. I had no intention of eating these bananas. All I wanted was some warm banana bread. 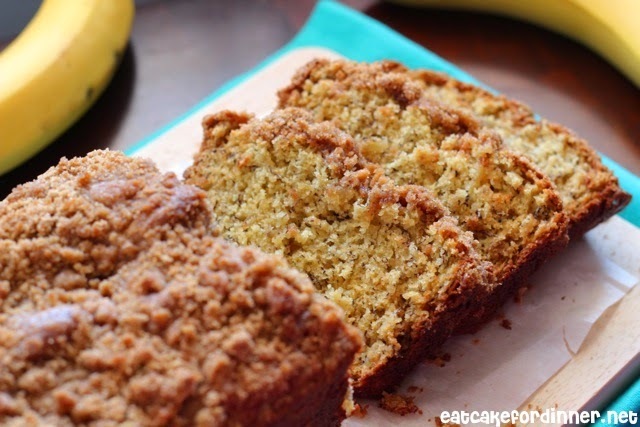 I used one of my favorite Banana Muffin Recipes and adapted it slightly with the ingredients I had in my fridge. I love this recipe because it makes a light and tender bread and who doesn't love a buttery sweet streusel topping. 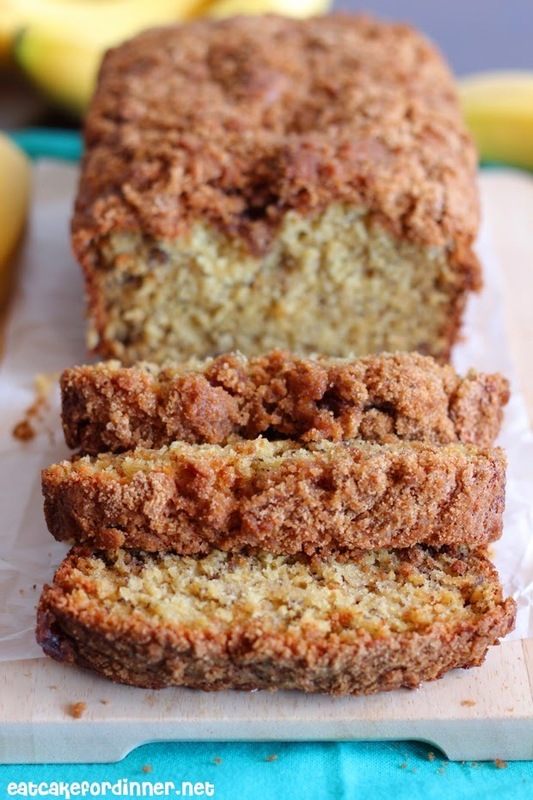 Plus, it has some wheat flour in it, less butter and slightly less sugar (even with the streusel topping) than a lot of banana bread recipes. You could even cut back on the sugar in the streusel topping if you would like. 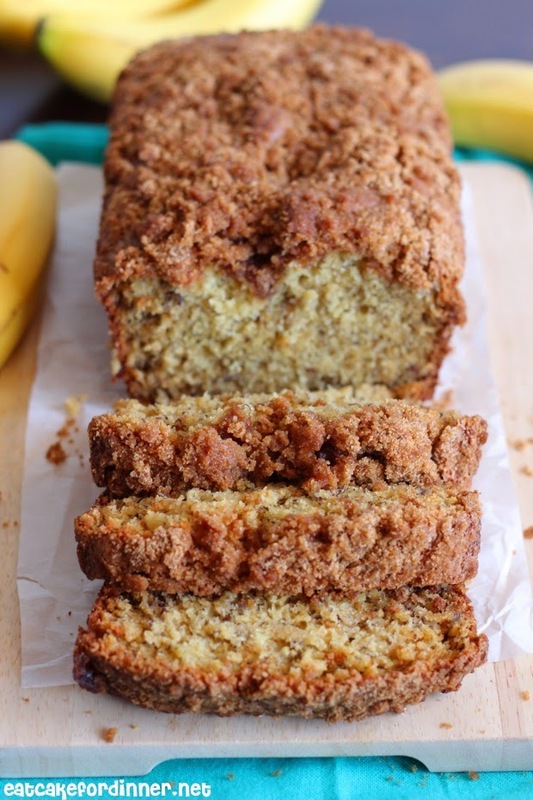 If you have any ripe bananas sitting on your counter, you should make this for Breakfast tomorrow morning. Preheat oven to 350 degrees. In a medium bowl, whisk together the flour, wheat flour, baking powder, baking soda and salt. In a separate bowl, whisk together the mashed bananas, melted butter, sugar, egg and buttermilk until smooth. Add wet ingredients to dry and stir together until just combined. Pour batter into a greased 9x5-inch loaf pan. For the topping: Combine brown sugar, flour and cinnamon. Add the cold butter and using your clean hands, work the butter into the dry ingredients until it resembles wet sand. Sprinkle topping over loaf. Bake for 42-45 minutes or until a toothpick inserted in the center comes out clean. If the top begins to get too brown, tent a piece of foil over the top while it finishes baking.